Freemasonry was popular in London in the 18th century. The first Masonic Grand Lodge was established in London, on June 24, 1717. The first permanent lodge of Freemasonry, this was a conglomeration of four such organizations. Within 30 years Freemasonry spread across Europe and into the colonies. Many colonists involved in the early formation of America as a separate country were Freemasons. The Masonic organization was successful since it was a fraternity that ensured provisions for members and their families. Masons worked to improve their surrounding towns and villages. They often built orphanages, homes for widows, and homes for the elderly. The organization strove to better its members through philanthropic endeavors. The Grand Lodge of Kansas was chartered on March 17, 1856, five years before Kansas became a state. 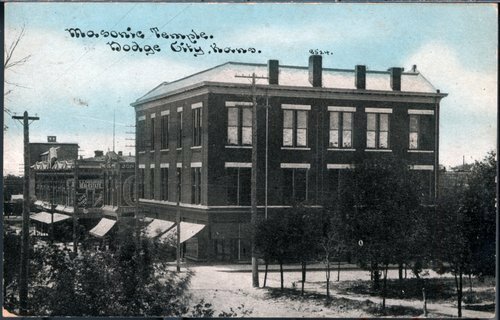 Masonry spread across the state and in the late 19th and early 20th centuries many Kansas towns featured a fine Masonic Temple. These buildings often provided housing for other local fraternal organizations or clubs in the area. Many of these structures stand today to remind of the prominence of the fraternal orders. We invite readers to contribute to this article.